The actor appers in the remake of 'The Wolfman', the decades-old horror-film. The stars shed their fur for the Los Angeles premiere of the film on Tuesday night. Benicio Del Toro said that the relationship between the father, played by Anthony Hopkins, and his role of the son is different than in the original movie. He also hinted, "This one might have a couple of more spooks." Actress Emily Blunt said that while the new version pays "homage" to the first, "I think that we've kind of amped up the volume a bit because that's what you have to do for a modern audience." 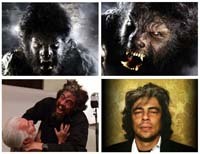 When the full moon came out and Benicio was in costume, "I thought I looked like my dog," said the film's star. 'Wolfman' howls into theaters on Friday, February 12. Entertainment Tonight News has contributed to the report.